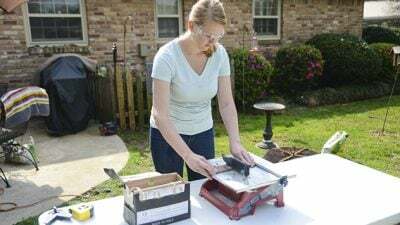 Chelsea Lipford Wolf cuts tile. Homeowners often wonder which projects they can take on themselves and which ones require hiring a professional to do the job. I visit my daughter Chelsea’s house to see a few projects she has done in her home. Check out Do It Yourself or Hire It Done for more info. I also had a stain that was sticky after 3 days. I did as suggested and added more stain and wiped it off. It worked and the door is beautiful. I bought my home 40 years ago, at age 19. I planted a 1 ft Magnolia seedling, from my hometown in Charleston, MO I was told it would die if I planted it in St. LOUIS,MO, too far north. My little tree is now 16-20 ft. BUT, over this past summer something happened & almost half died. I trusted my prize would survive & decided not to cut down. I have been watching the enter limbs sprouting new growth. I don’t know when or if I should trim the limbs that look dead. CAN YOU GIVE me guidance to ensure my beautiful tree survives & thrives? I am so glad to learn how to use a new paint stirrer that attach to drill w/o transfer to a 5 gal. bucket, wasting paint & still making a mess. Now, I will pick up extra gallon lids for each color of paint I buy. Thank you for your tips, as a Senior Citizen & feel like a novice once again, they are invaluable to me.